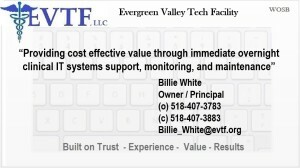 EVTF, LLC A WOSB in upstate NY . Serving the immediate IT needs of Clinicians across the U.S.
EVTF, LLC A WOSB providing affordable healthcare IT support when the clinicians need it. NOW!